For a year or so I’ve been loosely monitoring the activities of a coalition of social and environmental activists called Common Cause. They’re steadily building a collection of theory and case studies aimed at developing a new methodology for motivating people to get involved in social and environmental movements. The Common Cause website – http://valuesandframes.org/ is worth checking out because it’s rooted in some of the most recent research in cognitive science and social psychology. But as well as gaining some insights from their work with Values and Frames, it’s also made me reflect yet again on activists I’ve known and what has motivated them. One recurring theme is that the people who work most passionately on global social and environmental challenges are those who been plucked from their comfortable western lives and been transplanted for some time into another culture somewhere else on the planet. If you live for a while in the slums of Latin America – as I was lucky enough to – you inevitably take on an intense layer of empathy with the struggles of the slum-dwellers. If you spend time with Pacific Islanders whose houses and crops are increasingly threatened by rising sea levels and higher-intensity storms, climate change activism becomes an innate urge. There was an extreme example of the motivational power of personal experience in the 2011 SBS TV series Go Back to Where You Came From. Before her personal experience travelling to refugee camps, Raye had no sympathy for the asylum seekers who died in December 2010 as a result of their boat hitting Christmas Island. ‘It served the bastards right,’ she said. But the Go Back experience had a profound effect on her views. But obviously not everyone can have that depth of experience, so the analysis from Common Cause is an important contribution towards nurturing more social and environmental activism in the general community. 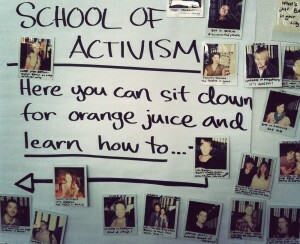 This entry was posted in Activism and tagged activism, cause, environment, nurture, volunteer by New Internationalist. Bookmark the permalink.